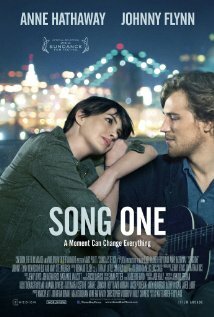 ‘Song One’ is an 88 minute Brooklyn summer romance-indie-hipster drama starring Oscar winner Anne Hathaway (Franny), and West London folk singer, Johnny Flynn (James Forester). Franny, who is studying for her PhD in anthropology in Morocco, receives a call from her mother stating that her brother, Henry, has been hit by a car crossing the street, is in a coma in the hospital, and asks that she return to NYC. Franny visits her brother in the hospital often, and by searching through his belongings, listening to songs he has played, musical videos he has recorded, and journal entries he has written, gets to know what his likes are and where his interests lie. She stumbles upon an unused ticket for a musician that he really respects, James Forester, at the Bowery Ballroom, 6 Delancey Street on June 1, 2013. She attends the show, and approaches the acoustic guitarist/violinist at the end, asking him if he might have known Henry personally. James did not know Henry personally, however, demonstrates empathy, and visits Franny, while she is visiting Henry in the hospital. Franny and James begin reliving her brother’s Williamsburg musical lifestyle, while recording sounds of NYC that he might be familiar with, meanwhile, continuing to visit him in a coma, playing the recordings for him, and getting to know one another on a deeper, more personal level. Ballet 422, directed by Jody Lee Lipes, opens in New York at the Film Society of Lincoln Center, and the Landmark Sunshine Cinema, on Friday, February 6th, 2015. Have you ever wondered how a ballet gets created, the costumes get designed, the timing is mastered, and the pointe shoes get sewn on? 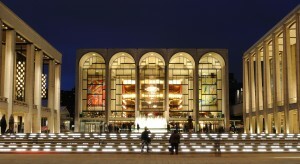 Founded in 1948, the NYC Ballet staffs a full orchestra, costume shop, lighting department, production crew and 91 full time dancers. 25 year old, Justin Peck, has been a member of the NYC Ballet since 2007, and was commissioned to choreograph the only new ballet in the 2013 winter season, with only 2 months to prepare. Assemble’s (A jump that lands on two feet). Two months, two weeks, one week, as the premiere of “Paz de la Jolla” draws closer, the film reflects back on all the hard work and practice rehearsals that it took to lead up to the big night. You are currently viewing the archives for January, 2015 at One World Cinema.